"For countless aeons you've waited in exile beyond the limits of the universe, but now your time for revenge is at hand. In your possession are the ancient stones of the Eternal Ones - and with them the power to overthrow the Gods and eradicate all of creation! 50 Phase-Out sequences are all that stand between you and the end of the universe, your one and only chance to undo all the work of your ethereal oppressors and to rebuild the Cosmos to your own design..."
Developed by Ernst Neubeck and Simon Quernhorst, Phase Out is a game that will put your puzzle-solving skills to the ultimate test. Play the role of a vengeful banished deity and bring an end to the universe by completing the 50 ancient stone challenges of the Eternal Ones. Fail and you'll remain in exile for ever, succeed and unlimited power will be yours! Limited to 50 individually numbered cartridges (each box bearing an RGCD COA sticker), these won't last long so grab your copy from our online store today! Phase Out has been tested on both PAL and NTSC machines, and works on the C64, C128 and C64GS (there is no keyboard input required to play). 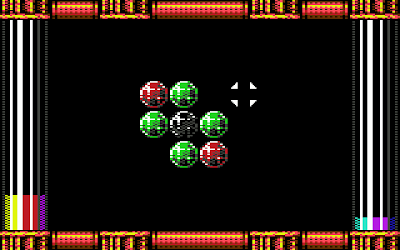 Although it runs on NTSC hardware, it does play fractionally faster and will be harder as a direct result of this. As such, the game is labelled as NTSC compatible, but designed for PAL systems. Featuring box and poster artwork by Steve Day, the 16KB PCB is housed in a clear cartridge shell illuminated internally by a colour-changing rainbow LED and the game comes complete with an 8-page printed manual, two code sheets, a vinyl Phase Out sticker and a (folded) A3 poster. 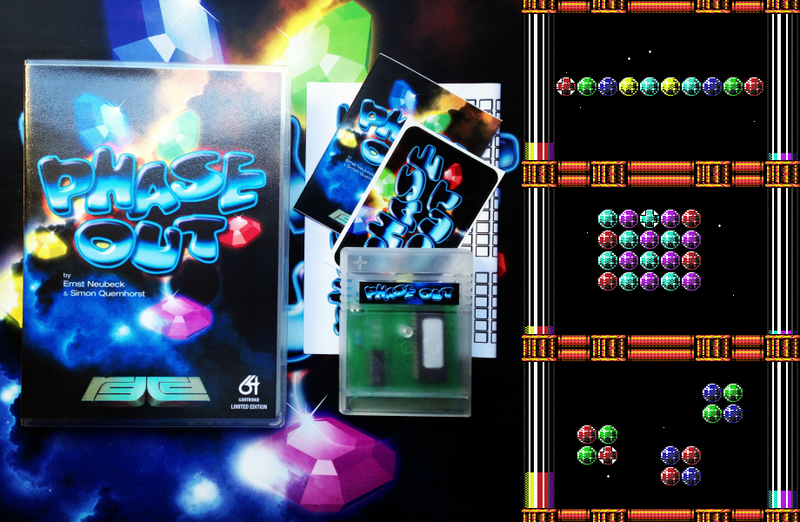 Phase Out is presented in a modified plastic Universal Game Case complete with custom made foam insert (as with the rest of our deluxe range). The game is priced at £25, and shipping is £5 for UK/Europe and £7 for the rest of the world. A digital version of the game will also be sent out to all customers following receipt of payment. Please note that Psytronik Software are also selling Phase Out on premium/budget disk and tape for £9.99, £4.99 and £4.99 respectively (plus shipping) via their Binary Zone Retro Store. The game is also available to buy as a download direct from INC-X for €1.99.